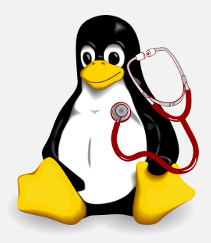 Lsof is linux command used for output files and processes related information. lsof support different type of file formats like regular file, directory, block special file etc. lsof provides given command output parsable format where other tools like cut can be used to filter output. In this tutorial we will look different use cases of lsof command. In order to run lsof command without problem and full fledged mode we should provide root privileges. The most basic usage of lsof is executing without providing any option. We will run lsof . 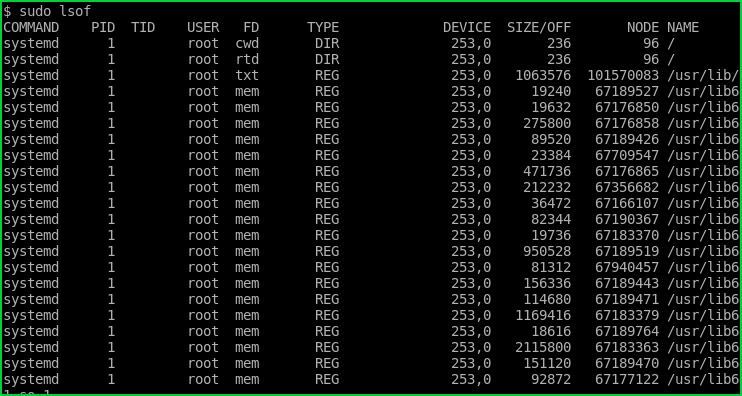 FD columns shows file descriptor like memory, txt etc. Here list of FD or File Descriptor Types. We can list processes those opened given file. We only need to specify the file with its full path. Another useful option is listing and filtering files according to given process name. We will use -c option and the process name. In this example we will list files opened by the ssh process. LEARN MORE How To Add or Change Default Route or Default Gateway in Ubuntu, Linux? We can also list processes according to file mount point. Actually this is the same as with the directory option +D . In this example we assume that /dev/sdb0 is mounted at /mnt/ and we want to list only this partition processes. Now another useful option is listing files according to process owner. We can use -u option with the process owner name. In this example we will list files those have opened by the processes owned by ismail. In previous example we have listed all files opened by given user. There is also situation where we want to list opened files except given user. We should add ^ before the user name. In this example we will list all files opened except user root . We can list files opened by specific process by providing the process id. We will use -p command and processes id . In this example we will list files opened by process id 1107 . We may need to refresh lsof output repeatedly. 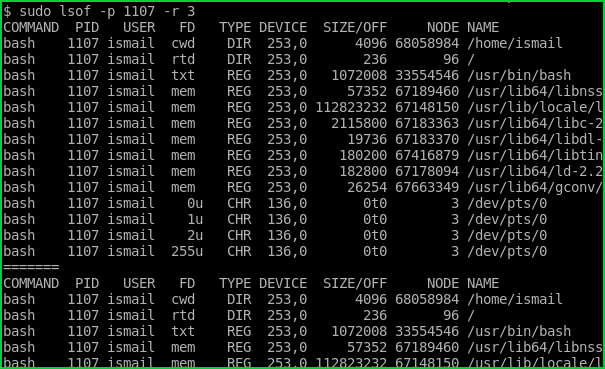 This can be done with helper commands but lsof also provides option for this -r and period in seconds. In this example we will repeat lsof output in 3 seconds. lsof command can be accept multiple options to filter. The default behaviour is or logic for all given options which will create a long list. If we need to and given options we can use -a .In this example we will list only files opened process id 1107 and owner ismail . lsof command is very capable with network connections. We can list currently opened network connections with the -i option like below. We can list only IPv4 opened network connections with -i4 option like below. We can list only IPv4 opened network connections with -i6 option like below. We can list processes according to their opened ports. We will use -i : option and the port number. In this example we will list processes opened port 22 . We can list only TCP connections with the -i tcp option. We can list only TCP connections with the -i udp option.